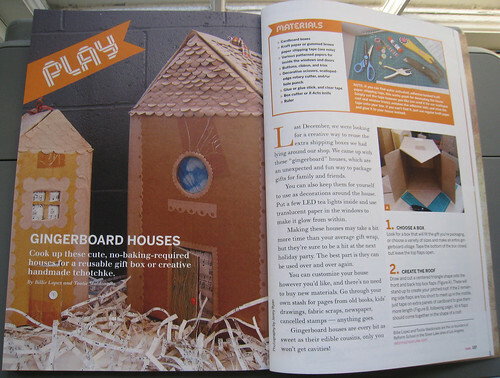 This is great new way to recycle old boxes and make them into reusable cute gingerbread houses. 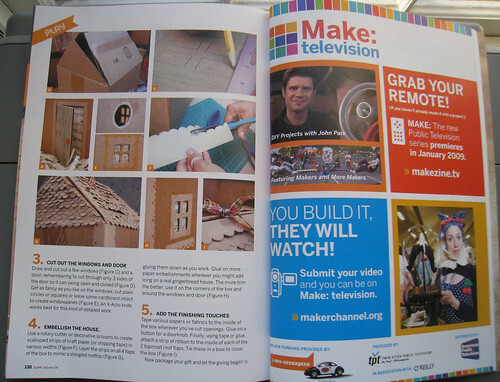 I found this this fun diy project in the recent issue of Craft: magazine. The mag suggest you use the gingerbread houses as gift boxes. Or you could work on the projects with you little ones. I am sure they will love playing with the homemade houses all winter long. Oh, these are too cute! They also remind me of my brother’s helpful suggestion each time I try to make gingerbread houses with the kids and the icing we are using as mortar won’t hold the house together. He’ll say, “why don’t you use a cardboard box in the middle to hold it all up and use a some hot glue?! They’ve dispensed with the whole idea of an edible house. I like it. love this blog..it's giving me lots of good ideas…just wanted you to know I nominated you for kreative blogging…pass it on!